I promised a cruelty-free beauty gift guide, and here it is…my favorite beauty gift sets for Christmas 2018! I’ve sorted this gift guide into four categories: stocking stuffers, save ($10+), spend ($20+), and splurge ($30-$50). There’s a good mix of skin care, color cosmetics, and more. And most importantly: everything is easy to order online from Ulta or Sephora (the two major beauty retailers here in the U.S.), with the exception of the Essence and Julep boxes in the “splurge” section, which can be ordered through those brands’ websites. In other words, you won’t need to jump through multiple checkouts or even change out of your pajamas to order enough gifts to cover everyone on your list. Scroll through to see all my picks, and click on any of the pictures to view them full screen. Elbow-deep in Christmas shopping? You might also want to check out my bookish gift guide, gifts for guys under $50, cozy gifts for almost anyone, and last-minute gifts you can shop online or at the drugstore! Yay, it’s the weekend! I’m excited to spend some time curled up on the couch with a good book and some homemade chocolate chip cookies. 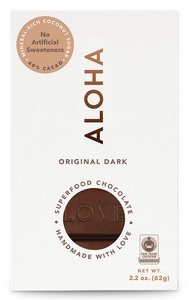 Unfortunately I can’t give away a plate of cookies here on the blog—I’m pretty sure they’d be fuzzy before they made it through the post to the winner!—but I’m giving away something else delicious instead: a bundle of Aloha Superfood Dark Chocolate bars. If there’s a way to make these bars better for you, I’m not sure what it is: they’re vegan, kosher, USA-made, non-GMO, free of soy and gluten, and made with fair trade ingredients. They’re loaded with superfoods like wheatgrass and moringa for a nutritional boost. Oh, and they’re pretty tasty, too! One reader will win a six-pack of original dark bars; you can enter using the Rafflecopter widget below. Impatient? Head over to the Aloha website and order your own six-pack in original dark, hazelnut & fig, macadamia & coconut, tropical twist, or cereal crunch. 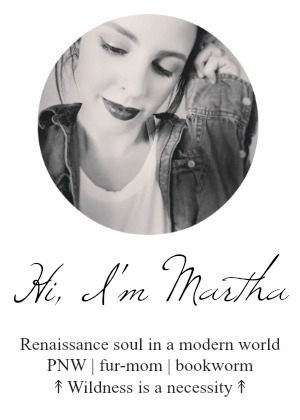 You can use the code “MARTHA37” to get $20 off your first order! The giveaway is open internationally and will close next Sunday. Good luck! Can you guys believe it’s July already?! We’ve had nothing but sun lately and temps near 100, and it’s been intense–even driving in the car you’re liable to get a sunburn if you don’t slather on SPF first. Kelly from Block Island Organics got in touch recently to see if I’d like to review some of their new mineral sunscreen and of course I jumped at the chance to try it out–here’s what I thought after a long, bright weekend! What it does: A lightweight, fast-absorbing sunscreen free of nanoparticles, gluten, animal ingredients, artificial fragrances and dye, parabens, phthalates, sulfates and petrochemicals. (Whew, what a mouthful!) Suitable for face and body. Block Island Organics is family-owned, USA-produced, and committed to producing simple, effective, affordable formulas without the harmful ingredients found in traditional skincare products. I tried it: Hands-down, my biggest pet peeve with sunscreen is that it feels and smells like, well, sunscreen. You know: greasy and chemical-laden, and not at all pleasant. You can’t exactly forget you’re wearing it. Luckily, sunscreens have come a long way in recent years and now we have products like this one, which are so light you might mistake them for regular moisturizer. 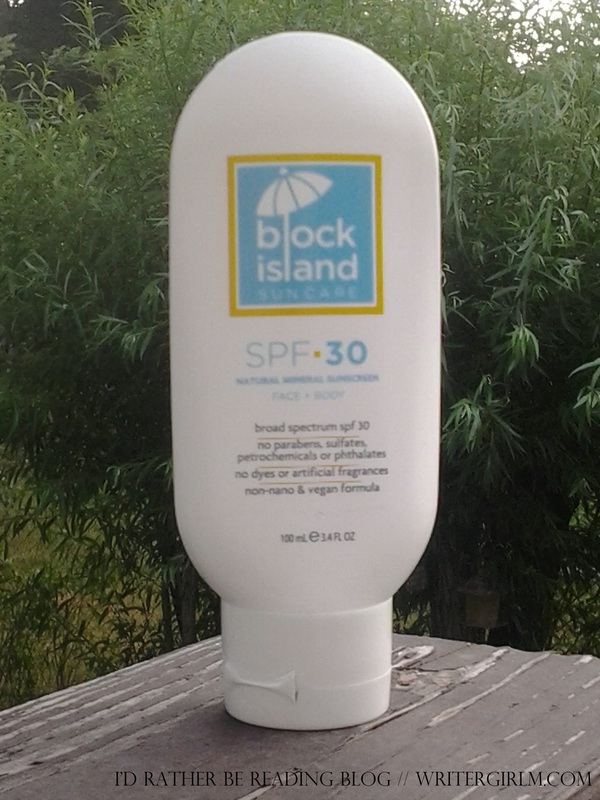 In fact, I would say this is one of the nicest sunscreens I’ve tried recently in terms of weight, texture and scent. The formula is super-thin, so it absorbs quickly and without that infamous white cast left behind by some zinc sunscreens. My skin felt dry to the touch afterward. The scent is nearly undetectable, too, and the dye-free/fragrance-free formula didn’t irritate my sensitive skin. I also have to say that I really, really love being able to tote one bottle in my bag for face and body alike! I’ve found some sunscreens that were fine for my body, but couldn’t be used on my face because they stung my eyes, turned my skin slick or made me break out. Not so with this sunscreen! You could easily layer this with makeup if desired; I used it over my regular facial moisturizer. This sunscreen isn’t waterproof, so you’ll need to reapply after swimming or if you’re sweating heavily, but since you’re supposed to be reapplying your sunscreen frequently anyway, I don’t feel like this is a big deal. It’s so light, and a little goes a really long way–no need to goop it on–so it doesn’t feel like you’re suffocating your skin. Overall I love this sunscreen; it takes all the “yuck” out of daily wear, so I can stay protected from the sun without feeling uncomfortable in my own skin. Block Island Organics has generously offered readers a 15% sitewide discount, so you can try out their products for yourself! Just use the coupon code “Martha” at checkout, now through July 7th! 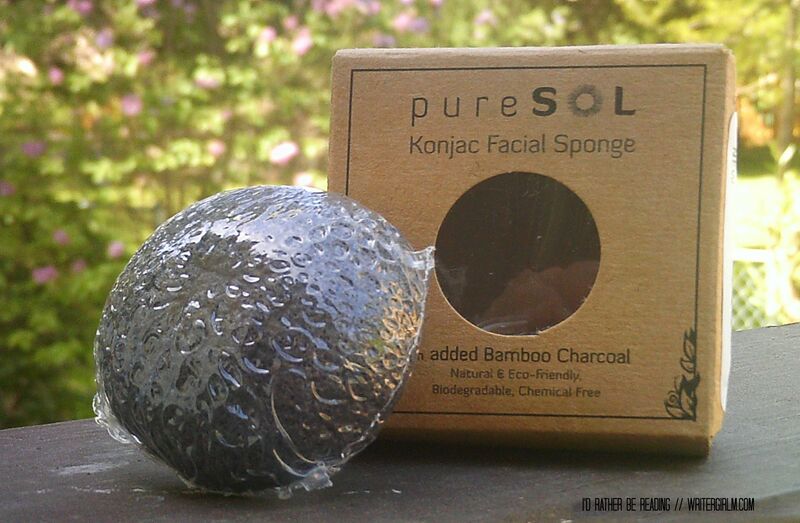 The product: PureSol Konjac Facial Sponge with added Bamboo Charcoal; retails for $24.95 at Amazon.com (buy it here). Currently on sale for $10. Check out the company’s Facebook page here. The claim: Cleanses, exfoliates and brightens skin. Because it’s so gentle, it’s perfect for even very sensitive or irritated skin. Can be used solo or with your favorite cleanser. Ingredients: Made of vegetable fiber and lacking any processed ingredients or additives (fragrances, colorants, etc. ), this is a 100% green and vegan product. When you’re done with it, it can be composted or even simply tossed in a flower pot rather than going in the garbage. I tried it: Every once in a while I come across a new product that truly earns the “holy grail” status in my beauty stash. I didn’t know what was so special about this sponge until I ordered it; within a week it shot to HG status and I don’t see that changing any time soon. 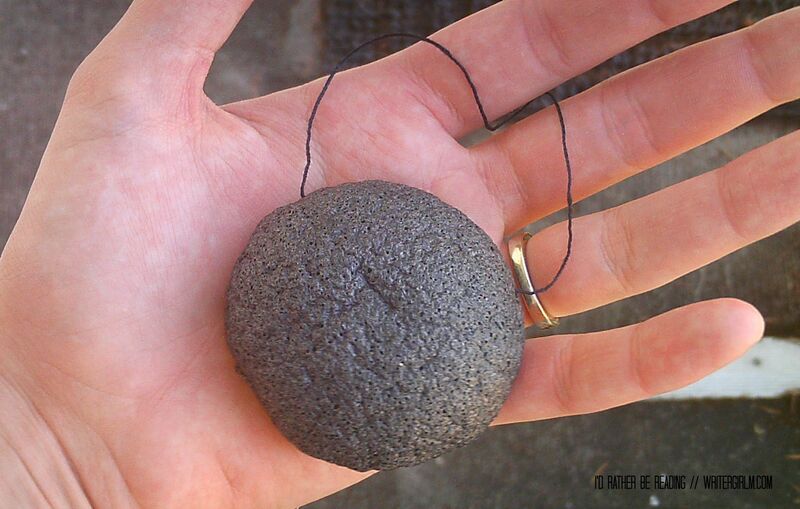 The picture above shows the sponge when dry; after about ten minutes soaking in a bowl of water, it expands by about 50% and becomes super-soft. There’s a little string so you can hang it up to dry in between uses (a suction cup hook is included in the package). The sponge can be easily sterilized every couple of weeks by popping it in the microwave or in some boiling water. When you’re done with the sponge (the company says each one lasts about two to three months), throw it in the compost pile or even in a flower pot–no waste left over for the trash! I also love that it’s 100% chemical-free and has no scent. This sponge exfoliates in the most oh-so-gentle way imaginable, making it excellent for anyone with hypersensitive skin or a condition like rosacea that can be irritated by exfoliating facial scrubs. You almost can’t tell that it’s exfoliating–it’s that gentle–but you can definitely see and feel the difference once you’re done. It’s much gentler than using a washcloth. I love using this with a basic foaming cleanser in the mornings–it’s a great way to get that “glow” without irritating my skin with a scrub (and you shouldn’t be using those scrubs every day anyway, as we all know!). I’ve been using this every day for about a week or so now and my skin is positively glowing. The irritated red patches around my nose and jaw where over-exfoliation was irking my skin have disappeared. My pores look smaller, most noticeably in my T-zone, where it’s always been a battle between blackheads and over-exfoliation. My skin feels super-soft, too. Adding this unassuming little sponge to my daily skin care routine has done more for my skin than any other product I’ve tried since Christine got me hooked on the Seventh Generation Boost serums last winter. I can now safely say this is one of those rare skin care products I’m not willing to live without! My final review: 10/10. This is truly the best new facial product I’ve tried in a long time, and I would recommend it to anyone. Will definitely be repurchasing when I’m done with this one! I thought it would be fun to start doing a regular feature of ethically sourced, charitable, vegan and/or made in the USA fashion picks. I don’t know if I’ll do this on a monthly basis or just as the mood strikes me. 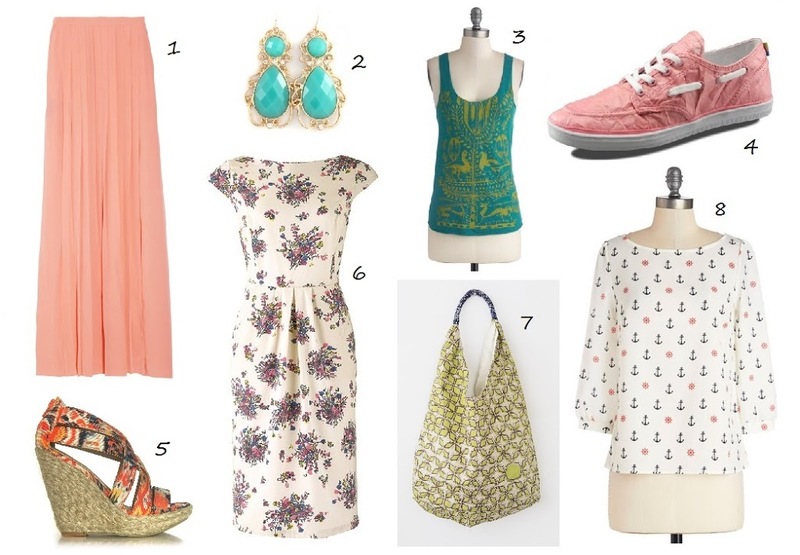 For now, here are some spring picks for you, all under $100. 1. Folk Like Us cotton crinkle maxi skirt; $54 (converted from pounds) from Fashion Conscience. Fair trade. 2. Crowned Earrings; $28 from Roozt. Designer Glit-Z donates a portion of proceeds to charities benefiting autism awareness and child abuse prevention. 3. Hopeful of Life tank; $27.99 from ModCloth. Made in the USA. 4. On Deck sneaker in pink; $60 from Pure Citizen. Vegan, fair trade, recycled and eco-conscious. 5. Chinese Laundry Vegan Milk Shake Tribal Wedge; $80 (converted from pounds) from Fashion Conscience. Vegan-friendly synthetic design. 6. Ellie Bouquet Dress; $80 (converted from pounds) from People Tree. Organic and fair trade cotton. 7. Everyday Hobo; $32 from One Mango Tree. Locally sourced and stitched by Ugandan artisans. 8. Heads or Tailwinds top; $37.99 from ModCloth. Made in the USA.